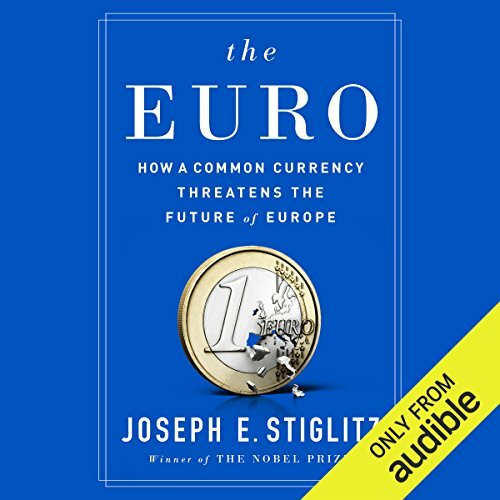 ©2016 Joseph E. Stiglitz (P)2016 Audible, Inc. This book is very disappointing. Stieglitz is very partial and not convincing. He affirms, and seems not to take in account many factors of the crisis, which have nothing to do with the euro. He just scapegoats Euro and the euro zone, and repeats himself very often. His view on the Euro and its failings is first rate, especially the highlights on Greece e.g. 80% of the Greek bail out went to repay German banks on Greece's nickel. . If he had left his Marxist soapbox oratory out and stuck to facts concerning the Euro it would be a briefer and better listen. Again in the last chapters his basic premise on the having a regional Euro system, make great deal of sense then he throws in a completely unworkable system of his own devices that take away from the impact of his good ideas. The final takeaway from this book however is a warning as to Germany's clear ambition to conquer Europe by financial means, after failing twice in the last century by militarily means. What disappointed you about The Euro? This is a treatment free of data, analysis, theory, or anything other than vacuous polemics. Almost the first hour of this thing is taken up by the author citing the many commissions on which he has served on, the many important people he has met, the books he has written, the schools he has taught at, etc., etc., ad nauseum. This must qualify as the most pompous, tedious introduction in the history of "literature" (to abuse that term in the present case). at Germany, endlessly and tirelessly repeated, but without anything substantive to back it up. The author must think that if he repeats the same assertions enough times that translates into an argument. If I were a professor at Columbia, where this fellow says he teaches, and a student handed in this thing, I would flunk him. What character would you cut from The Euro? The analisis and approach of the economic diferences and how they affect in different manner at each country, they are aspects I have not thougth before, as a supporter of a single currency. People is different, values are too, and certainly, because of that, ones suffer more than others. Amazing. It make me think twice on my preconceptions of economics. Written in a clear and simple way. With a very basic knowledge of economics, it is easy to follow. I strongly recommend it. ANY questions about the Euro? THIS IS IT! What did you love best about The Euro? Very comprehensive evaluation from inception to today. A bit negatively biased but very well documented and explained. Strongly recommend for anybody that would like to better understand anything about the Euro. Stiglitz answers ALL the questions: What?, When?, Who? Why?, Why not? In summary: great job! If I wanted to listen to completely partisan BS about this topic I’d have listen to Alex Jones sit on his thumb. I was hoping for a thoughtful discussion about the situation not a blame game book full of pure ignorance. Stiglitz is too political to write objectively on this subject. I was hoping to learn something technical and theoretical about the reasons for the failure of the Euro, but instead mostly got leftist drivel about the need for more command economics. some interesting conceots and ideas, but why did it have to be so long and go over and over and over and over again over the same things? The main idea to take from this book is "There must be more Europe or less Euro"
Someone who clearly supports socialism and government controlled markets. Has The Euro turned you off from other books in this genre? What three words best describe Alex Hyde White’s performance? Disappointment at the poorly constructed arguments. Lacked an objective analysis of the issues in Europe. This book was clearly an attempt to please Mr. Soros, who was praised in the acknowledgements. In the author's overzealous attempts to paint Greece as victim only he offered one sided and biased evidence. A great deal of this evidence was weak. To sum this book up: The EU us failing because government isn't playing a big enough role. The markets of Europe would be better off as "controlled" markets instead of "free" markets. This is an excellent book. It is heavy with complex economics and his recommendations are contrary to current practices. I would like to see a book that presents a view defending past practices and justifying their disappointing results. Until then I will assume that Dr. Stiglitz is correct except possibly on climate change. With the world population increasing at about 83 million people per year and no end in sight, I think that is a lost battle. Without population control and a decreasing population, it is hopeless. Population control is just not likely to happen due to religious taboos, human nature, and inertia. Who has never imagined to realize a dream and experienced that when it finally becomes true, the unintended, annoying and untold parts become visible and the immediate exit seems to be the best solution? Joseph Stiglitz tells this kind of story about the dream of European unity with the Euro as its crowning element. A crowning element that is heavy and the heads for which it is intended are either unprepared or even not capable of supporting. The crown is thus being passed around, even forcibly to the unfit with a threat of a non compliance fee. So no surprise that some heads are looking for an escape, while others are taking their strong heads as a divine gift and enjoy the accumulation of fees. But exactly the avoidance of a preliminary end through the abolishment of the fees and some more support from the stronger heads is Joseph Stigliz's plea. Since in the end the dream is not nightmare but a vision of a land of milk and honey and the beauty of the crown more than just aesthetics.